The AFL pre - season competition, begins on Thursday 26 February, in Tasmania. The Hawks and Magpies play, in a night game in Launceston. A fixture of games will then be played Australia wide, in many country towns, and non-traditional venues. The AFL are hoping to grow their supporter base, provide quality entertainment, and move on from the Essendon Football Club, supplements allegations. 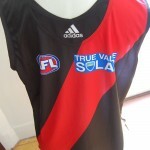 Footy starved fans will be attending matches, wearing their AFL football jumpers, jerseys, guernseys. This entry was posted on Tuesday, February 24th, 2015 at 11:18 am	and is filed under AFL, football jumpers. You can follow any responses to this entry through the RSS 2.0 feed. Both comments and pings are currently closed.